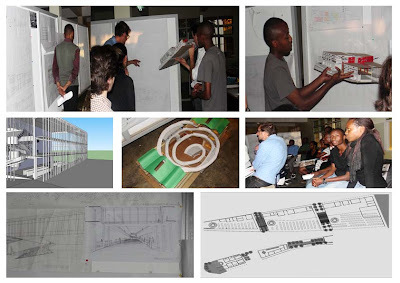 The final review of the second year’s architecture studio took place onTuesday 23th august. During this semester the students have spend about 6 weeks rethinking and designing Nyabugogo market. The presentation was divided in different categories refering to the main concepts of the students. Some students put emphasis on materials and forms while others worked on ground manipulation, negative public spaces, or continuity. As It’s become a routine there were more than class lecturers to comment the works of the students including Sierra Bainbridge(Head of Department of architecture); third year’s design studio lecturers(Tomà Berlanda , Nerea Amoros Elorduy and Keffa Angwenyi) and first year’s studio lecturers (Yutaka Sho and Christian Benimana). The Project was a success to students as it was commented during the crits. They worked through challenges in the overall project. The fact that the site was an urban infill incorporating a public space like a market, without forgetting the problem of hawkers and circulation(vehicular or pedestrian) and also taking into account that students came up with solutions to most of those problems was a good and recommendable work. However, Students were asked to work on their drawing and presentation skills by working together and helping each other to improve one another’s.